← Rocky Mountain Rainbows 2012! 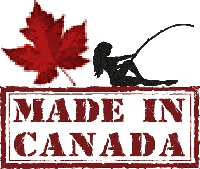 Fly Fishing from Shore 101 … by Ron W.
Fly Fishing from Shore ……. 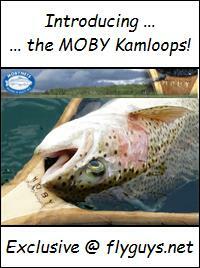 In 2012 I caught over half of my fish fly fishing from shore or public docks. I thought I’d share some lessons that I’ve learned. A heavy rod, heavy line and heavy leader. I fish a 7-8 rod with an eight weight floating line. I use 8 lb test or heavier. The fish aren’t bigger from shore but the obstacles can be. If you are trying to horse a bigger fish through the reeds or away from a brush pile you will appreciate a heavier set up. If you don’t want your tippet snapping off when you hook a reed, stick or bush you need a heavier leader. You will hook bushes on your back cast so get used to it. Pack a hook sharpener. Since you will be hooking things in the shallows and on your back cast check your hook frequently. It’s easy to break off or dull your hook if you hit a rock or hook a dock on your back cast. A hook sharpener is small enough to keep tucked away in your pocket and will allow for quick touch ups to keep your hook nice and sharp. A long handled basket net. While you can drag fish up on the shore you will injure them if you want to release them. And even if you’re bonking them you still risk getting any exposed part of the hooked snagged up on shoreline vegetation while trying to get your fish ashore. If you are fishing among the reeds or from a dock the long handled net is a must. I’ve seen a lot of fish lost right at the dock or shore. Waders. 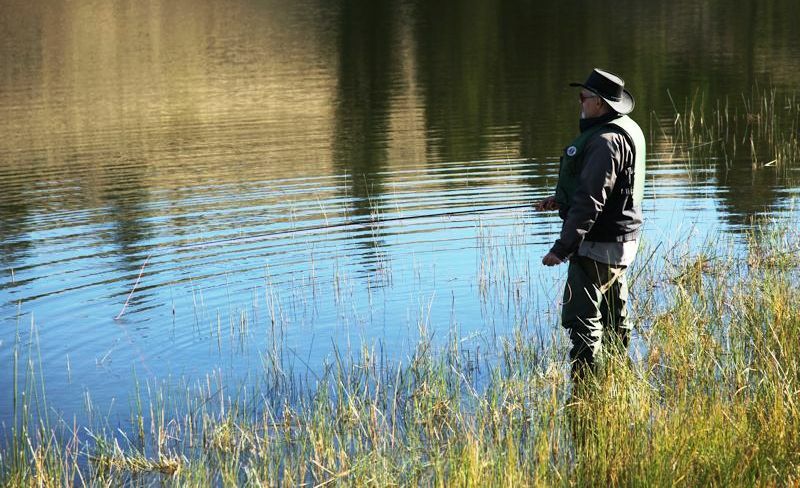 Waders help increase the areas you can fish. Sometimes you just need to get past the reeds or brush pile to create enough room to back cast or avoid getting hooked on an obstacle. Not every lake has a dock or flat clear spots to cast. 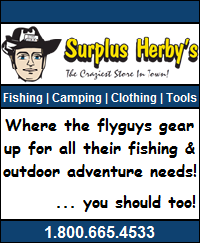 If you don’t have, or want to purchase waders then at the very least invest in a cheap pair of high top rubber boots to help get you into better position without getting your feet soaked. Sometimes that lack of room will force you to modify your casting techniques. The steeple cast and the roll cast are sometimes required where there isn’t enough room behind you. The steeple cast has an abbreviated back stroke while the roll cast starts from the 12 o’clock position with a violent forward down stroke to impart force to the line. If all else fails you could always spin cast with a fly under a bobber. The wind can be a nuisance if it’s in your face but it can also be your friend. Try to find a spot where the wind is blowing out . This may mean a longer walk to a different position on the lake but it will be worth it as it will make casting easier and keep your line and indicator straight out from you. 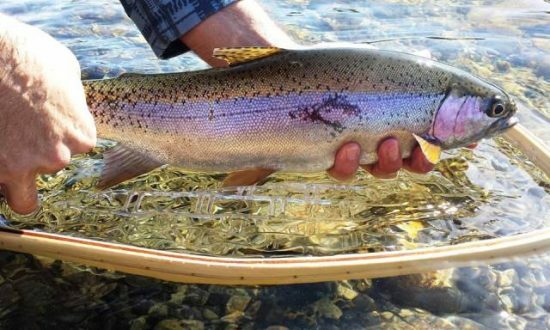 The chop on the water will impart action to your fly and make the fish less wary as it breaks up the water surface. If you don’t know the lake watch for rising fish or insect and bird activity for a place to start. 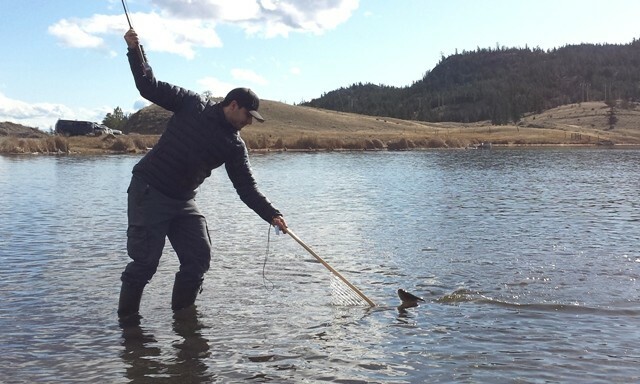 I caught most of my fish in the spring on chironomids while I caught fish in the fall on leeches and pumpkin heads. There are always scuds and leeches in the shallows so they are never bad choices. 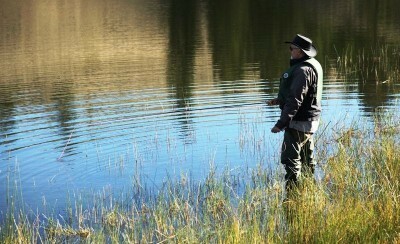 Fly fishing from shore can be very productive in the spring and fall when the water is still cool. The fish will come right up to the shore to feed and you can catch them in a foot of water if they don’t see you. The water is normally too warm in July and August for shore fishing to be productive unless you go very high or try near dusk or dawn. This entry was posted in Still Water Fly Fishing and tagged Bank Fishing, Dock Fishing, fly fishing, Shore Fishing. Bookmark the permalink. Awesome article Ron! Thanks for sharing it on our site! I don’t think enough people realize the incredible fishing opportunities available in our area even if you don’t have access to a boat! Thanks for the good article Ron. I still occasionally fish from shore at a select few lakes and it is reasonably productive. As an added bonus it cuts down on time spent loading/unloading the boat and makes short trips more worthwhile. Strike indicators become even more useful when fishing from shore (unless you like constantly hanging up on weeds) as they keep the fly in the zone as long as possible.